The Transatlantic Council is excited to offer a new summer camp opportunity for the camp season of Summer 2019. We have discovered a great location along the coast of the Adriatic Sea on the Westernmost tip of Croatia. Some of the unparalleled experiences our council can offer to our Scouts is the unique travel destinations where we hold our camps and other events. 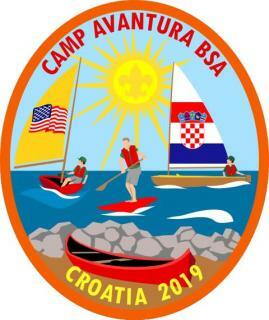 Camp Avantura BSA is a waterfront camping experience on which we can offer our traditional BSA summer camp just steps from the beautiful Croatian beachfront. The camp was originally built to serve youth organizations and was designed with youth summer camp programs in mind. The location is right on the waterfront and has one of the most scenic camp dining halls we have ever seen! The search for this location was inspired from the desire to continue our former high adventure warm climate aquatic themed camps of years past. The Croatian coastline is renowned for warm water all summer long and clear snorkeling adventures await us! All of our aquatics will take place in the Adriatic Sea so be ready to see some amazing sights while at camp! We will offer scouts two choices for their week of activities. First, we offer a ‘first year camper’ program to assist Scouts that are new to BSA programs by accomplishing many requirements towards the Scout, Tenderfoot, Second Class and First Class ranks along with some merit badge classes. Second, for those more experienced Scouts we will offer and a menu of merit badge classes as well as some extra high adventure options to spend a productive week at camp while still creating fun memories for our Scouts to grow from!